Most people see October as the beginning of the Season of the Witch, this is a modern trend in a time when Witches are a bit more tolerated than in the past. However, in Agro-cults this month is the Season of the Reaper. It is Harvest. The whole of Nature ( in places where there are four seasons ) is changing her clothes. The Tarot card image on the left picks up some of the colors I see in mid- October in the beautiful Hudson Valley of Upstate New York . The Hudson Valley was home to the Mahican/ Mohican and the Wappinger tribes. Fall was their time to hunt. 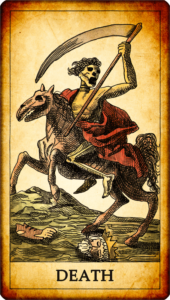 Traditionally, the Death card in Marseilles Tarot carries no title but only the number 13 usually in the Roman form of XIII just as the Fool card is a cipher which shows no number only its title. Many modern folk want to mitigate the meaning of Death. Death is death. His tool, the Scythe is the same instrument farmers use to clear their fields at Harvest, only Death clears the ranks of men. Ripeness of his fruit is not determined by age, but Death is death. 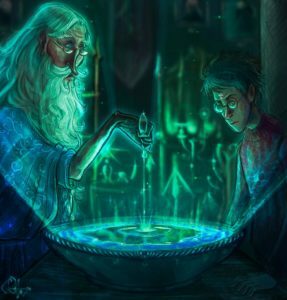 It is a withering which announces Death’s approach which like “age” may not always be seen on the flesh but is more an unraveling. Death’s scythe can strike the hail and hearty as accident, the old and frail as evident, but Death is death. Death is a permanent ending to a situation, person or thing. It cannot be revived. It is over and done once the Scythe has been swung. Death has to be accepted. It may take some time as one may cling as the last autumn leaves on the trees before first snow, but Death is death. The concepts of what happens after Death is not the point of October harvest but is to be found in the pantry of November remembering. On the Hermetic Path of Tarot one has to learn of the elements. The elements are the components of the physical and the psychological aspects of the human being. How do we go about doing this? We have to enter the Court of the Tarot Deck and salute the Royal Arcana. Each suit represents an element ( fire, water, air, earth) and each has a ruling hierarchy symbolized by the King, Queen, Knight and Page. In this ranking each element is represented, i.e. all Kings are Fire, each Queen is Water, Knights are air and the Pages Earth. For example the King of Wands is Fire of Fire while his Queen is Water of Fire. In the Suit of Disks The Knight is Air of Earth, while The Page of Swords is Earth of Air. Each court card is a combination of suit element filtered through the rank of the Royal who presents it! The so called personal attributes of the Royal Arcana are in truth coded energy patterns. We know the energies themselves have “natures”. Fire expands, Water contracts, Air moves and Earth supports. By their natures Fire and Water, Air and Earth are in opposition; while Earth and Water, Air and Fire are complementary. This helps us to read the energies of each Royal Arcana or Court Card and hence the effect it has in any grouping of cards. 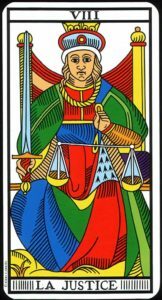 The new reader of Tarot is often perplexed as to why the Court cards appear so frequently in readings. The answer is they do so to show the patterns of energy the Querent is working with. However, one has to step beyond the lore of coloring and the assignment of human personalities and their traits as persons around the client in fortune telling and move into the realm of divination in the Hermetic system, which views the Royal Arcana as being both internal and integral to the client. The Royal Arcana is seen as a means to weigh psychological components. This is the hinge on which the entire process hangs- the alignment and balancing of the candidate’s internal energies. 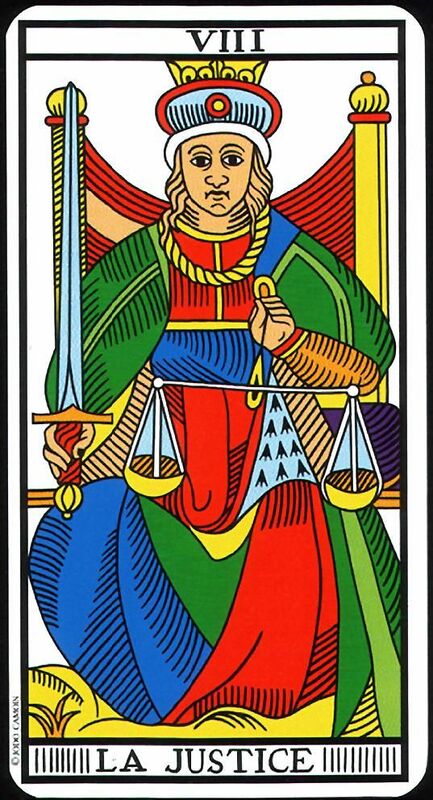 It is fairly easy to read the symbols on the Major Arcana in terms of their placement on the card. There is above and below, left and right and center and there is also the corners of the cards which the eye uses to focus and confine the images inside a border or boundary. The way the images face and what direction they look towards is another layer of symmetry or pattern formation. 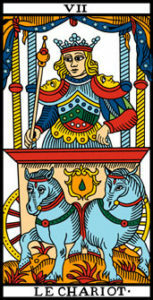 As an example in the Chariot card all eyes are directed towards the left- both the eyes of the Driver above and the eyes of the horses below in the image. The Camoin-Jodorowsky deck shows a red center line which divides the card in half marking the space of firmament /stars and foundation/ soil and plant life- the celestial and terrestrial realms . In the Devil card shown below the center of the card is marked by curved lines. Between the red curves is a face on the stomac h of a Devil standing on a raised spherical platform. The world “above” the center is marked by wings and overt breasts while the world below shows male genitalia, eyed knees and two chained minions. The symmetry is present but the location is not the same as is shown on the Chariot card. 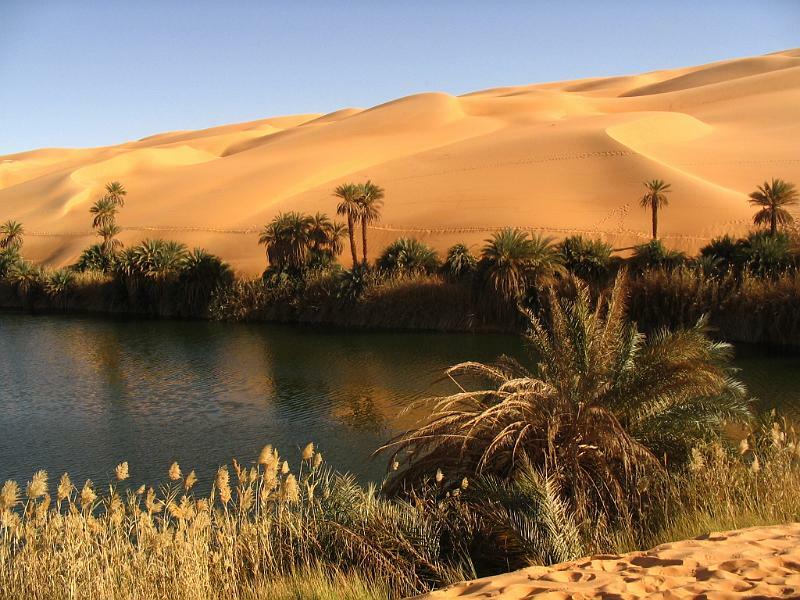 There is white sky and water behind the figures and the minions do not stand on red soil but on black land. In order to understand Major Arcana scenarios the reader has to juxtaposition sides, tops, bottoms and corners to ascertain the location in which energy is held. To see where energy is being directed one looks at the eyes of the dominate/larger or central figure on the card face. 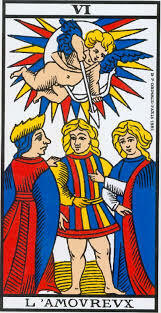 Another element in evaluation of the Major Arcana is color and shading. 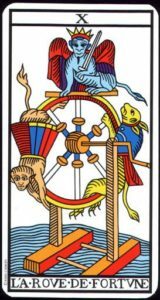 In the Chariot and the Devil cards above we see the light blue skin tone is used to denote a non-human and an animal figure. In the Lovers the contrast of blue, red and yellow as bold colors adds “temperature”. The red color can show us what is hot or active; blue what is cool or inactive and the yellow what is neutral or not yet fully engaged, i.e. undecided. The coloring and geometric placement of symbols dominates the Major Arcana just as the numeric code is the power element in the pips of the Minor Arcana. 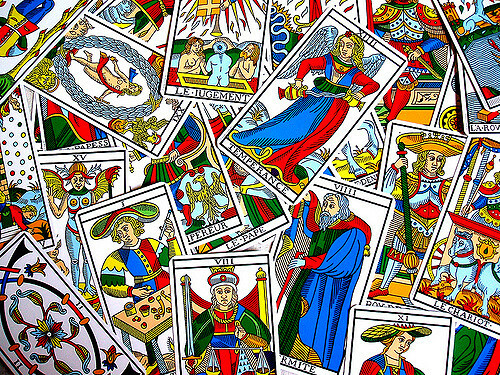 The use of keywords for the Tarot Trumps does not allow a reader the agility required to flow into the narrative and tell the tale. Keywords like borders on cards isolate and short-circuit the energies released in a layout. When starting on the Royal Road of Tarot where exactly do we begin? Most look at the numbers on the Arcana and start with 1. 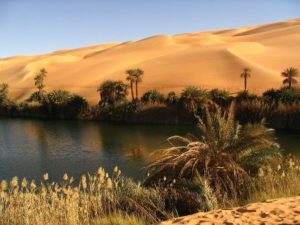 As human beings in existence the place we begin is generally where we are. People are not balanced at the beginning of any new endeavor. The old name of the Magician was The Juggler. Juggling is a skill which has to be practiced in order to be developed. So the Magician is not a starting point but a process. 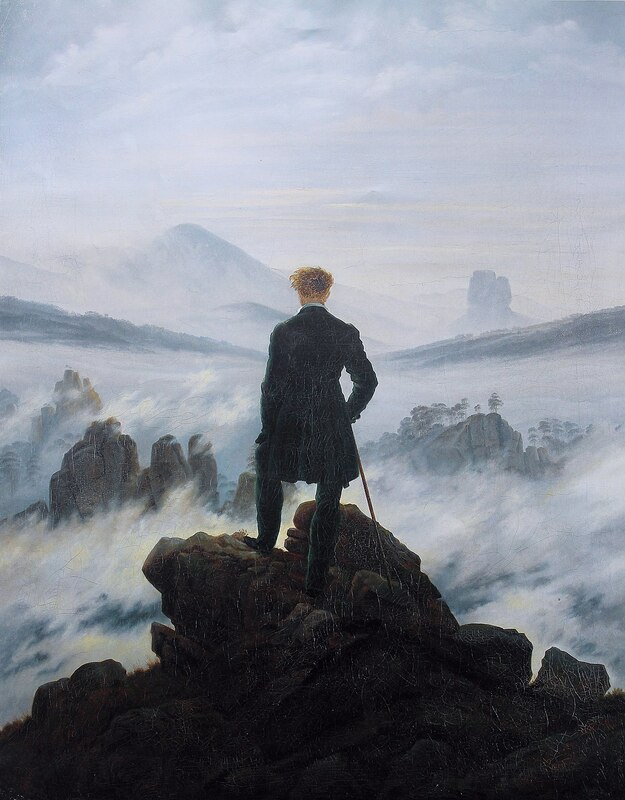 Other’s may look at the numberless Fool and believe this is the place to begin. The Fool of Tarot was unnumbered and ungendered. 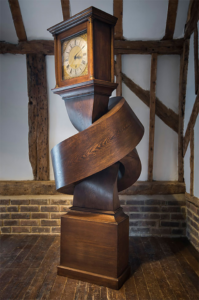 In time it was assigned a zero or cipher. It is nowhere and everywhere, shifting in space. 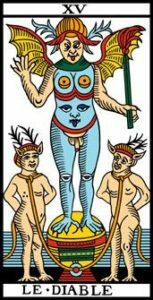 The Fool is best associated with oddities, synchronic phenomena, warning signs and things which like it’s rank in the deck cannot be classified. One can think of The Fool as carrying all the X-files in his pouch, those things people see and blink at closing their eyes as their belief systems reject, deny or ignore the unfamiliar usually at their own peril! Again The Fool is not a firm or formed starting point in the physical realms. Many will say why not start at the end/beginning or card 21 which is The World? The World card represents existence and all contained therein. However, this is a vast fluid plane, an entire playing field and not all of its levels are mapped out! The beginner can easily be overwhelmed at the outset by too many possibilities. Not to select a starting place is a choice as well, one which delays the start of training. 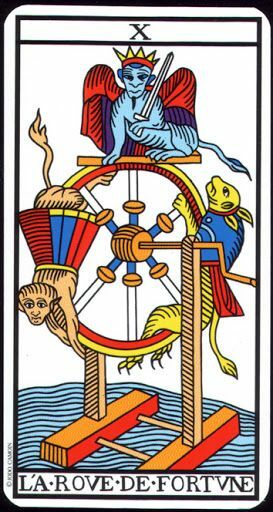 The proper place in my estimation to begin study of the Tarot Trumps as a tool to self development is to be found within the book of the 10th Major Arcana – The Wheel of Fortune. This is where mankind finds themselves moving in circles/space and cycles/time between their Beast of Instinct, Tyrannical Ego and Human Intelligence around a center point of Consciousness. It has been hot as Hades in Upstate New York. Been out and about and getting a lot done. Unfortunately, most of my work is not Cartomancy oriented… Give me a few weeks and a chill in the air and I’ll be back on schedule with a vengeance- I swear.